Fashion Polish: Glitter Gal Australia new collections! Glitter Gal Australia new collections! Please welcome - Shade Shifters, Transitions, Opal Collection and Essentials! These special effect polishes and colours have been developed wholly by us, produced by us and sold only by us. As usual, they are only made with the best ingredients and highest quality base materials. They are 3 Free, long lasting, chip resistant and suitable for markets world-wide. “Shade Shifters” are a metallic shade shifting finish with intense primary color effect which reflects a different color spectrum when viewed at a different angle. These affects are similar to those you see on wings of exotic beetles - a transition from one shade to another when viewed from different angles. There are 2 distinct finishes available for our Shade Shifter range -“Brilliant” and “Soft”. “Brilliant” Shade Shifters - have a very bright glitter effect showing slightly larger particles with the base colour being a metallic copper bronze appearance with subtle shade shifting under tones in colours like green, blue, violet and red. These polishes are definitely the “blingiest “ones we have. “Soft” Shade Shifters – similar to our “Brilliant” effect, they are based on a copper/bronze metallic with subtle under tones of green, blue, violet and red. The only difference is that these have a finer, more polished look with the under tone colours shimmering over the exotic base colour. They are truly “take your breath away” beautiful. This is a line that we will be building on over the coming months, however, the first 4 colours in each style are currently to “whet your appetite”. An innovative range of complementary nail polishes that transforms your favorite Glitter Gal nail polish colour into a new and vibrant color effect with an almost ethereal quality. These transition effects come in 4 magical colours : violet, blue, green and red. When brushed over one of our Glitter Gal Australia crème nail polishes it transforms into a new effect with the subtle over tones of the colour you have chosen in the transition. Additional coats will strengthen the effect. For the most dramatic results they are best applied over our Glitter Gal Australia “Serpent” Black which is as black as black can be. These transitions work best over any deep strong colour, the possibilities are endless. So with just one bottle of our transitions you can transform any base colour into a new and magical effect. For a soft subtle appearance, the transitions can be worn directly over the nail giving a distinct yet captivating pearl effect. We offer these to our customers so that they can breathe new life into their existing colour palette with stop and stare looks. These three finishes are best applied over a dark base and will transform your crème finish into what we can only describe as a gem stone quality, opal appearance. The inspiration for these came from the opal mines of outback Australia and represent the best that our outback can produce. They are named after historic and significant opal towns in the Australian outback. Two essential polishes are a must to add to your Glitter Gal Australia collection. Use these polishes to create dimension to your special effect polishes. “Serpent”– a remarkable jet black crème polish with the highest contrast, best levelling and glossiest effect available. Perfect to be used in conjunction with the Glitter Gal Australia Transitions and Shade Shifters. Shade Reference Code - GGNP101. 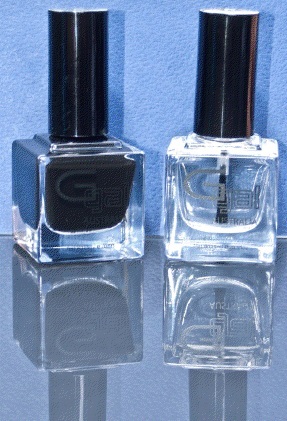 “Gem Stone Top Coat” – the perfect, glossy top coat that protects and “shines”. Once you’ve used this little gem, you won’t look any further. Shade Reference Code - GGNP102. I am sooo excited! Can't wait to try out those multichromes! Thanks Mate from the Glitter Gals - Kerry and Anna, we cant wait for these to be released! I am loving the blue flakies!! I am super excited over the shade shifters and the transitions. I love effects. These transitions are like nothing I have seen around before! Wow! Instead of layering over the black though, I am going to layer it over a jelly white polish (OPI Don't Touch My Tutu) for a look that is more true to the opal that comes out of Coober Pedy!